Since inception, Wevin Private Limited (Previously known as Webb India Private Limited) has been a leading Material Handling Systems Integrators in the Indian Automotive Industry. 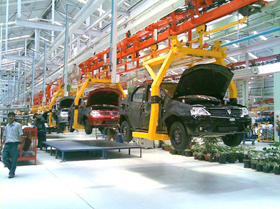 Our systems run successfully in almost all leading automotive plants. Our systems make a huge impact in the industry by increasing productivity, lowering costs and revolutionizing the way automobiles are built. Wevin offers a wide variety of material handling technologies to ensure the right solution to meet any manufacturing needs. Whether it's increasing productivity, reducing operating costs or improving inventory management, our automated systems keep things moving efficiently and effectively. Today, our automotive team uses that same ingenuity to design the most durable conveyor systems for automotive manufacturers around the world. And when time is money, you need a system that never stops. But our expertise extends beyond conveyors.